You are nearly ready to buy your first Bitcoin, but before you do, you need to verify your account by uploading your identification. This is commonly known as KYC which means Know Your Customer. Due to the developing yet uncertain regulatory framework for Crypto Assets, most leading exchanges have a KYC process in place to prevent fraud. 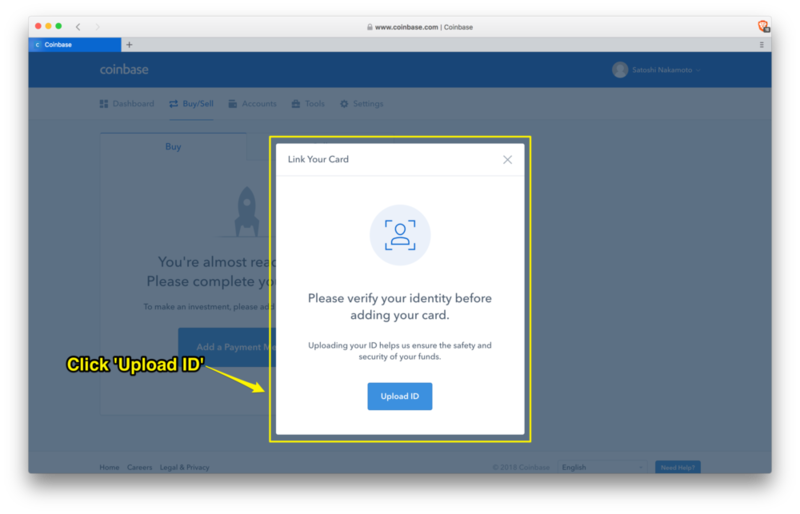 Before you can add any financial information to start buying Crypto Assets on Coinbase, you first must upload your ID. To begin the process, click on Upload ID. Select the one you which you would like to upload, I have a preference for passport and driver's license. Whichever you choose, Coinbase will ask you to either upload photos or take a photo of them with your webcam. Once you have uploaded the photos, click the Upload button. Once you have submitted your information, you will see a screen which says We're verifying your ID. This usually only takes a few minutes. Once ID verification is complete, you will receive an email confirming this, and the screen will change to say Identity Verified. Now you are ready to upload your financial information. Now your ID has been verified, you can move onto Module #3: Lesson3, where you can add payment methods.